I sometimes make mistakes. When I first used Leap, it was in the early public beta, and when Ironic Software released Leap 1.0 with no release notes (they never publish release notes outside of the download, which is annoying) and tiny, skewed screenshots I had no idea that Leap had changed drastically between the initial public betas and the final version. Thankfully a reader called me on my error, and so I’ve taken a second look at Leap. Although I still think it’s priced a bit high, I was completely in error about Leap’s existence in limbo between file system taggers and file libraries. Leap is a full-fledged file system tagging solution that is unlike any of the other solutions currently on the market. It certainly isn’t perfect, but Leap provides a number of different ways to access your tagged files and introduces a unique way of working with files in your current folder hierarchy that no other tagging software provides. 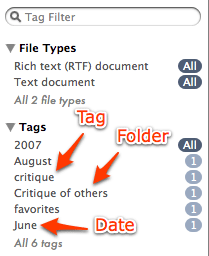 The most important thing to know about Leap is that it both reads and writes Spotlight comments tags that use the & or @ syntax (&tag vs. @tag), which means that if you’ve been rolling your own file system tagging using TagBot, Default Folder X, and/or Quicksilver Leap will fit right into your workflow without effort. This is kind of a big deal, so take a moment to ponder it. You don’t have to have Leap running to do basic file tagging. You can use tools like Hazel to automatically tag files using Spotlight comments, and Leap will keep track of them. In case you’re wondering, this is very cool. Granted, Spotlight comment tagging is still a sub-optimal solution, but since Apple hasn’t seen fit to give us the tool to implement true Spotlight tagging there’s not much we can do. Leap will also optionally write out your tags to Extensible Metadata Platform (XMP) or Spotlight kmdItemKeywords. XMP is a technology developed by Adobe intended to embed metadata into files (as far as I know, Spotlight has no knowledge of XMP metadata, so unless you use it already for something you probably won’t need this feature). Using kmdItemKeywords doesn’t actually work the vast majority o the time, because it will be overwritten by a documents default Spotlight importer (which is why most file system solutions use Spotlight comments). Nonetheless, it’s nice to see that Leap covers a number of unconventional bases. The first button in the crumb trail lets you save your search as a bookmark, while the rest of it does the heavy lifting. Basically, the crumb trail is like a sentence: “I’m looking for what in where that contains search term.” As you select tags and so forth to refine your search, they show up in the crumb trail. For instance, the screenshot shown is saying “I’m looking for tagged files in all preferred places that have the tag critique“. In an interesting move away from the norm, Leap doesn’t provide any sort of over-arching tag cloud, either for browsing or editing. Sure, there’s a tags window that will let you rename and delete tags, but it only shows those tags that are available in the active search. For people used to tagging software that lets you manage all of your tags whether or not you know which documents use them, this will be pretty strange and awkward. There are a number of other features (and a couple small interface annoyances) that have been introduced in Leap 1.0, but overall you should now have an excellent idea of how Leap deals with tagging. This is a new, innovative approach to tags that will allow you to ease into using tags without abandoning the information about files supplied by your folder hierarchy. I’m really excited that Leap reads in tags from Spotlight comments that you created before you started using it (or when the program isn’t running). Although I was a bit underwhelmed by the early public betas, Leap is now an excellent product to look into for tagging newbies and seasoned file system taggers alike, and a compelling alternative to the current file system tagging offerings.